January often puts a chill on comics sales, but not this year. Sales of comics to retailers in January were by low double-digits in every category, according to my analysis of the sales reports released by Diamond Comic Distributors on Feb. 17. Diamond's overall sales of comics, graphic novels, and magazines were up by 10% over last January, with dollar sales for both Diamond's Top 300 comics and Top 100 trade paperbacks up nearly 16%. Click to see the estimates for January 2006. We used to call this the "Dead Quarter" in part because January would flat-out kill whatever sales momentum had been building in the fall. Not so this year — at least so far. Comics unit sales: The Top 300 comic books had retailer orders of 5.57 million copies in January 2006, 11% more than January 2005, which had the same number of shipping weeks (four). The increase amounts to about 580,000 copies. DC's Infinite Crisis #4 took the top slot, moving more than 182,500 copies in January. Marvel had two top-ten debuts, with Ultimate X-Men: Extinction #1 moving 82,700 copies and X-Men: The 198 #1 selling 68,800 copies. Both Marvel and DC placed the same number of titles — 86 each. While fairly high for a month in which the major publishers have usually pulled back, reorders and titles solicited for earlier months account for part of those totals. For the first time in several months, there were no first-time entries from brand new publishers in the rankings; every publisher making the Top 300 has been there before. There are no year-to-date totals, obviously — it's just January! Comics dollar sales: The Top 300 comic books had sales worth $16.61 million in January, up 16% from January 2005, where sales were $13.88 million. Trade paperbacks: Led by Dark Horse's Serenity, the Top 100 trade paperbacks and graphic novels reported by Diamond had orders worth $3.54 million at full retail in January. That's up nearly half a million dollars, from 2005. Adding those to the Top 300 comics for the month yields $20.15 million, an increase of 16% over January 2005's total of $16.96 million. Overall sales: Diamond publishes dollar market shares for its top 20 publishers across all comics, trade paperbacks, and magazines. Knowing the exact total orders of any publisher on that list right down to the oldest backlist item allows you to calculate Diamond's total orders across these product groups. The January 2006 total was $25.56 million, which increases to $28.21 million, when Diamond's United Kingdom orders are added. The U.S. figure is 10% over the $23.2 million from January 2005. The slower growth in this overall category relative to the other categories suggests that while the backlist remains a huge portion of sales, in January the frontlist was where it was at. Market shares: Marvel led DC in Diamond's reported overall unit and dollar market shares. Dark Horse took third in every category but new issue sales, where it nonetheless came within 10,000 copies of catching Image, which released more than twice as many different new issues. IDW has settled in as a solid fifth in the comic-book categories, though Viz still outpaces it when the trade paperback backlist is added. 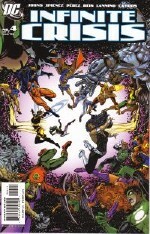 Price analysis: The average comic book on Diamond's Top 300 list cost $3.21, up from #3.12 in January 2005. The weighted average price — that is, the cost of the average comic book Diamond sold — was $2.98, up from $2.79 last year. The average price of the comics that made the Top 25 was $2.87. Clearly higher prices have contributed to January's success, but the 11% increase in copies sold tells us there's more to it than that. Be sure to follow Comichron on Twitter and Facebook!